This exclusive villa is set in amongst the sand dunes with direct access to the lagoon with a lovely beach area. The lagoon is popular for fishing, walking, swimming or just lazing about. This stunning villa offers 6 deluxe rooms upstairs (all-en suite) and a bedroom downstairs with private courtyard. The living area boasts an opulent lounge with fireplace, the brandy and cigar lounge has satellite television. A beautiful dining rooms has a fireplace for cooler evenings A library with business desk is ideal for those who need to mix business with pleasure. All these open onto a large verandah with breakfast facilities and covered lounge area. Lounge at the pool with it's tranquil lagoon and sea views. The kitchen has been especially designed with fireplace and centre kitchen table. 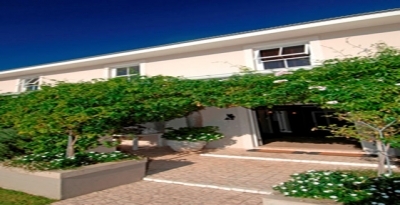 This beautiful home is situated between a golfing estate and bird sanctuary. With superb decor and fittings this is a wonderful villa for those who wish to pamper themselves.